The dialogue focused first on the theological concept of revelation, and in January 2006, ISNA and the USCCB published written discussion from these dialogues in Revelation: Catholics and Muslim Perspectives. In the 2011 Midwest Muslim-Catholic Dialogue, members provided concluding remarks on the latest publication efforts regarding the topic of Catholics and Muslims in the public square. Father Thomas Baima, University of St. Mary of the Lake in Chicago, distributed the recently published spring 2011 edition of Chicago Studies, which features the collected papers of dialogue members. 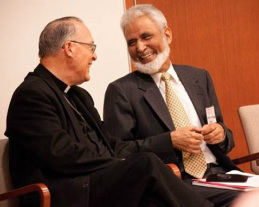 In 2012, the Midwest Muslim-Catholic Dialogue joined together with the West Coast and East Coast dialogues for a National Catholic-Muslim Plenary. It also brought together a joint written project on Catholics and Muslims in the public square, which will serve as a resource for local religious leaders and will soon be available to the public. The USCCB and ISNA have partnered on a number of other initiatives, including the Generations of Faith interfaith dialogue and the Shoulder-to-Shoulder campaign.